" Great prices on all items searched for. Really like the free shopping option - made the difference between purchasing here and elsewhere." Why is there so much pain and suffering in our world? What should we do with our nagging doubts? Is Jesus the only way to God? Based on the New York Bestselling book, The Case for Faith, this six-session, video-driven study addresses the most common obstacles to faith in Christ. Doubt is familiar territory for Lee Strobel, the former atheist and award-winning author of books for skeptics and Christians. But he believes that faith and reason go hand in hand, and that Christianity is a defensible religion. 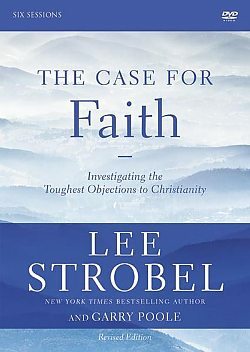 In this six-session video curriculum, Strobel uses his journalistic approach to explore the most common emotional obstacles to faith in Christ. These include the natural inclination to wrestle with faith and doubt, the troubling presence of evil and suffering in the world, and the exclusivity of the Christian gospel. They also include this compelling question: Can I doubt and be a Christian? Through compelling video of personal stories and experts addressing these topics, combined with reflection and interaction, Christians and spiritual seekers will learn how to overcome these obstacles, deepen their spiritual convictions, and find new confidence that Christianity is a reasonable faith. Format: DVD Rom - Region 0 What's a Region Code? There is an important truth that we discover as we experience that first Christmas....God always keeps His promises! God never gives you more than you can handle... alone. Discover the one drink that connects you with God's power. A Six-Session Investigation of the Evidence for Jesus.